The new year kicks off with new releases from Japan, Germany, and Italy. Every month, our staff members pick three notable new releases in world literature to review. 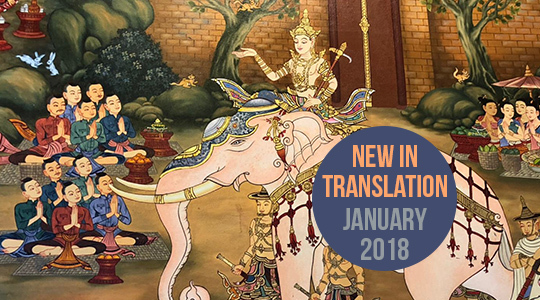 The first month of 2018 brings us short fiction from Japan and novels from Germany and Italy. Mention ‘contemporary Japanese fiction’ to the average reader and bestselling names like Haruki Murakami, Ruth Ozeki, and Keigo Higashino might come to mind; or indeed last year’s Nobel laureate, the British novelist Kazuo Ishiguro. From that perspective, at least, Toshiyuki Horie can be considered one of the modern Japanese canon’s best-kept secrets, happily resurfaced for an Anglophone audience by the ever-intrepid Pushkin Press. A critic, translator, and professor of literature, Horie has garnered numerous accolades for his fiction and essays, and is also—as the three novellas collected here reveal—a masterly prose stylist, a ruthlessly effective narrator, and a seasoned traveller between the real and imagined geographies of experience and history, dream and memoir, and past and present. 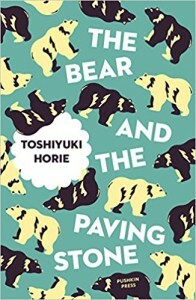 The first and longest section of the volume contains Horie’s novella “The Bear and the Paving Stone,” which won the Akutagawa Prize in 2001, and lends this volume its title. The tale opens in a strange, allegorical dream-sequence that ends just as abruptly when the narrator wakes, alone, in a rural farmhouse in Normandy. Drawing on Horie’s own time as a graduate student at the Sorbonne, the story unfolds with exquisite pacing into a long-awaited reunion between two unlikely college pals: the narrator (then a student from Japan, now a professional translator) and Yann, a free-spirited, petánque-playing photographer. As they embark on a breakneck drive to see the sun set over Mont St Michel from Yann’s favourite spot on the coast, we are plunged as if into another dream: this time, comprising the layered narratives of French intellectual history, the Holocaust and its aftershocks, and a post-modern, international friendship. Ghostly historical figures such as Émile Littré, Jorge Semprún, and Bruno Bettelheim haunt these pages with a sense of driving, almost teleological purpose, but the two friends’ conversation somehow remains light, and movingly human, throughout.